Six galleries of shots from Dolly's media appearance at Dollywood last Friday to open the new Wild Eagle roller coaster have been added to that section of the website here. (In addition, the problem with the audio files from the weekend that had prevented them from playing has been corrected.) In related news, an update about the park's planned Nashville snow and water park in partnership with Gaylord Entertainment is in The Tennessean here. Two Whitney Houston albums containing her cover of Dolly's "I Will Always Love You" remain on the Irish charts this week, it was announced Friday. Ultimate Collection loses nine to No. 17 pop, and Essential dips 21 places to No. 33 pop. The Bodyguard soundtrack falls off the top 30 compilation albums chart, down from No. 16 the previous week. Two new countries have signed on for releases of Dolly's movie Joyful Noise. In addition to previously-announced UK/Irish, Aussie/Zealand and Brazilian openings, it has been added to Japanese theaters for April 28 and those in Norway starting June 22. The movie grossed just under $31 million in a 10-week U.S. run and will be released here on DVD and Blu-Ray May 1. (Get your copy here!) In related news, the Joyful Noise Soundtrack continues to drop, the April 7 Billboard charts confirmed. The album falls off the 25-position soundtrack albums chart, down from No. 25 the previous week, and it slides in its 11th chart week four spots to No. 33 Christian albums and three places to No. 46 Christian and gospel albums, holding steady at No. 17 gospel albums. In other chart developments, Whitney Houston's version of Dolly's "I Will Always Love You" dips 15 to No. 37 R&B/hip-hop digital songs. Houston's Greatest Hits, containing the song, loses three to No. 9 pop albums but holds steady at No. 1 R&B/hip-hop catalog albums. It rebounds one to No. 1 pop catalog albums and falls six to No. 11 Internet sales. The Bodyguard soundtrack tumbles 21 spots to No. 41 pop but gains two to No. 3 pop catalog albums and one to No. 2 R&B/hip-hop catalog albums. It loses two to No. 4 soundtracks. Up north, her Essential is No. 10 Canadian pop and No. 1 Canadian R&B, The Bodyguard No. 73 Canadian pop and No. 14 Canadian R&B and Greatest Hits No. 19 Canadian R&B. The Little Willies' For The Good Times, with Norah Jones' cover of Dolly's "Jolene," falls off the 75-position country albums list, down from No. 66 the previous week, its 10th. Rhonda Vincent's Taken, with Dolly on one track, falls off the 15-position bluegrass albums chart, down from No. 15 the previous week, its 35th, while The Grascals' Country Classics With A Bluegrass Spin, with Dolly on three songs, re-enters that tally at No. 13 for a 53rd week. Overall, Luke Bryan's Tailgates and Tanlines holds steady at No. 1 country and rises two to No. 16 pop in its 33rd week, while the self-titled release by Casey James debuts at No. 2 country, No. 23 pop. Want a piece of Joyful Noise? A costume seller on eBay is offering what he claims to be a bra that Dolly wore in the film. The buy-it-now price is $1,000, or as of press time there were no bids with the starting bid open at $350. Check out the item here. '9 To 5' In Local Theaters In U.S.
Local productions of Dolly's 9 To 5: The Musical are springing up all over, it seems. The show opens in an Orlando, Fla., dinner theater on Friday, The Orlando Sentinel reported here, while The Rock River Times offers a review of its production in Ft. Atkinson, Wis., here. In related news, Megan Hilty, who played Doralee in the Broadway production and currently is on NBC in Smash, has signed with Sony's Columbia Records through its Masterworks subsidiary, The Hollywood Reporter reported here. Whitney Houston's Greatest Hits, featuring her cover of Dolly's "I Will Always Love You," will dip three places on this week's charts to No. 9 with 28,000 copies sold, Billboard announced with the top 10 titles being revealed Wednesday. When the full charts come out Thursday, it looks like the other title with the song, The Bodyguard soundtrack, will fall another 10-15 places to the mid-30s with about 9,000 units moved last week, preliminary charts indicated. Dolly was in Music City Monday night at the invitation-only annual Nashville awards dinner for the TJ Martell Foundation, which works to fund research in leukemia, cancer and AIDS. She was there to join Kenny Chesney in presenting the Tony Martell Lifetime Entertainment Achievement Award to former RCA Records head Joe Galante. Check out coverage from CMT here and Country Weekly here. 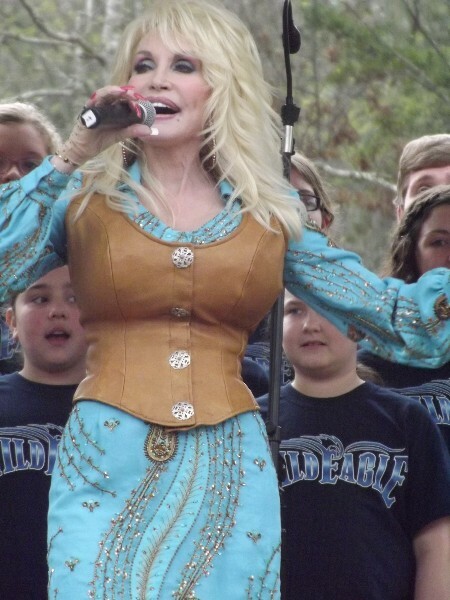 New pictures from Dolly's weekend appearances at Dollywood have been added to that section of the site here. Information on the new coaster was also issued in a press release, which is available from The Sun Herald here. In addition, coverage is available from Thrill Network here. Finally, The Knoxville News Sentinel talked with Dolly here about her new Nashville development with Gaylord Entertainment. The weekend box office receipts were released on Monday, and Dolly's film Joyful Noise was missing, suggesting it has left all cinemas that were showing it, thus ending its theatrical run after 10 weeks. It closed out its final four days on only 65 screens averaging just between $2,000 and $3,000 per night. Its ticket sales for the last week in the U.S. were $41,723 in 60th place for the week, bringing its cumulative gross here to $30,932,113. Another gallery from this season's opening of Dollywood has been added to that section of the website here. More to come! In other news, Behind The Thrills has coverage of the weekend here. Dolly loves The Voice and Smash, she told Knoxville News Sentinel writer Terry Morrow, also disclosing why she is unable to perform on the season finale of The Voice. Learn why here. The first high school production of Dolly's 9 To 5: The Musical has opened, and there's a great review of it in New Millford Patch here. In related news, the BBC reports here that tickets will go on sale Tuesday afternoon for the Manchester, England, opening of the British tour. Appropriately, the sale starts at 16:51 British time � nine minutes to 5 p.m.
Dolly made four appearances Saturday to officially open Dollywood to the public for its 2012 season and the Festival of Nations: the Irish Spirit of the Dance show, Ukrainian The Paper World Show by Mimirichi and Argentine Los Pampas Gauchos in addition to her Parade of Nations, which took place even though it looked like the rain would force cancellation of it as it did with her scheduled park tour on Friday. The rain held off just long enough for them to decide to allow the parade, which featured Dolly in a custom convertible painted to promote the new Wild Eagle roller coaster. It started raining just before the end of the parade, and Dolly was quickly given an umbrella to keep her dry. The first full galleries of Dollymania.net images have been posted to a new section of the site here. Additional coverage is available from The Johnson City Press here, Knoxville's WBIR TV here, and The Mountain Press here and here. After 106 weeks on the top 20 Australian albums chart, The Very Best Of Dolly Parton, Volume 1 is back off the tally, dropping from No. 20 the previous week. Elsewhere on the overseas lists, The Little Willies' For The Good Times, with Norah Jones' cover of Dolly's "Jolene," holds steady at No. 11 country in its 11th week on the U.K. charts. Whitney Houston's albums containing her cover of Dolly's "I Will Always Love You" continue to drop in sales. Essential loses a dozen spots to No. 32 British pop and 10 to No. 25 Australian pop. Also Down Under, Ultimate remains at No. 1 catalog but drops nine to No. 22 pop, while Greatest Hits loses three to No. 8 catalog albums and falls off the top 50 pop albums chart, down from No. 34 the previous week. Dolly pranced on stage to the strains of "9 To 5" Friday for a crowd of VIPs and media to celebrate the opening of Dollywood's new $20 million Wild Eagle roller coaster, the first wing coaster in the nation. "I'm a wild chicken, not an eagle, so don't think I'm gonna get on that," she joked with the crowd. She brought out American Eagle Foundation President Al Cecere. Giving him the microphone, as she pulled back, saying she was frightened by eagle Lincoln who was on his arm, he explained 20,000 birds of prey shows have been performed at the park since the Foundation joined the park more than two decades ago. He said 113 bald eagles and 10 golden eagles have been released in the Smoky Mountains and 330 across Tennessee through the Foundation's efforts at the park. Dolly presented him an oversized check for $36,000 representing the proceeds from the charity auction for the first 52 seats on the coaster's inaugural ride. Cecere thanked Dolly and the park for their support, noting it has come to more than $6 million over the past two decades. In a media Q&A, she talked about the park's success, 9 To 5: The Musical, what the eagle represents to the park (American spirit, joking that with the early effort to make the turkey the national bird it just wouldn't be the same with the "Wild Turkey" ride), the impact she expects from the new ride (attracting more teen-agers and "some of you old ones who still want to believe you're young"), and her upcoming water and snow park in Nashville. She then performed the ride's theme song, "Wild Eagle Fly," with the Knoxville Children's Choir and Dollywood singers as the first group of auction winners took the inaugural ride, closing with fireworks and confetti. "Good lord, I'd hate to clean that up," she exclaimed, adding shortly thereafter, "I have to go get the paper out of my chest." After the ride was concluded, she returned to the stage to take meet-and-greet photos with the auction winners. She made a brief appearance Friday afternoon at the Irish show, "Spirit of the Dance," to welcome fans to the park and thank the entertainers for coming. Unfortunately, her afternoon park tour was cancelled due to rain. She will return to the park for surprise appearances at various shows on Saturday, it's first operating day of the new season for the general public, including a 4:15 p.m. Parade of Nations through the park, weather permitting. Additional coverage is available from The Tennessean here, Knoxville's WATE television here, The Examiner here and Knoxville News Sentinel's Terry Morrow here. Images are � copyright 2012 T. Duane Gordon/www.dollymania.net and may not be reproduced without prior written consent. Click on the thumbnails for larger views. Three Whitney Houston albums containing her cover of Dolly's "I Will Always Love You" remain on the Irish charts this week, it was announced Friday. Ultimate Collection dips one to No. 8 pop, Essential rises three to No. 12 pop and The Bodyguard soundtrack dips two to No. 16 compilations. Sales for the Joyful Noise Soundtrack continued to dip last week, according to the March 31 Billboard charts that came out Thursday. The collection falls off the 50-position independent label albums list, down from No. 47 last week. It drops seven to No. 25 on the 25-position soundtrack albums tally, so it will likely fall off that one next week. It also loses three to No. 17 gospel albums, nine to No. 29 Christian albums and 13 to No. 43 Christian and gospel albums in its 10th week. The late pop icon Whitney Houston's cover of Dolly's "I Will Always Love You" falls back off the digital tracks chart, down from No. 42 last week, and digital songs chart, down from No. 43 last week, also losing 14 places to No. 22 R&B/hip-hop digital songs. Houston's Greatest Hits, which contains the song, holds steady at No. 6 pop albums and No. 1 R&B/hip-hop catalog albums but dips one to No. 2 pop catalog albums, two to No. 5 Internet sales and off the Tastemakers chart, down from No. 11, and digital albums chart, down from No. 21. The Bodyguard soundtrack drops five to No. 20 pop, two to No. 5 pop catalog albums and one to No. 3 R&B/hip-hop catalog albums. It holds steady at No. 2 soundtracks but falls off the Internet sales list, down from No. 11. Up north, her Essential is No. 7 Canadian pop and No. 1 Canadian R&B, The Bodyguard No. 54 Canadian pop and No. 8 Canadian R&B and Greatest Hits No. 73 Canadian pop and No. 11 Canadian R&B. The Little Willies' For The Good Times, featuring Norah Jones' cover of Dolly's "Jolene," tumbles 10 to No. 66 country albums in its 10th week. Rhonda Vincent's Taken, featuring Dolly on one track, holds steady at No. 15 in its 35th week, while The Grascals' Country Classics With A Bluegrass Spin, featuring Dolly on three songs, falls off the 15-position bluegrass albums list, down from No. 11 the previous week, its 52nd. Overall, Luke Bryan's Tailgates and Tanlines rebounds two to No. 1 country and four to No. 18 pop in its 32nd week, while Jason Aldean's My Kind Of Party rises two to No. 2 country and three to No. 21 pop in its 72nd week. Dolly will be in England later this year to take in some rehearsals of her new British touring production of 9 To 5: The Musical, The Daily Mail reported here Thursday. As Dolly announced a few days ago in her video diary, the show will open in Manchester Oct. 12. The newspaper adds that it is a national tour that will kick off that night and thus far has been booked into 10 theaters over a three-month period. Your webmaster is off to Dollywood to cover Dolly's appearances at season passholder preview day Friday and season opening day on Saturday; I hope to maintain the usual schedule of site updates while in Tennessee, but if I miss a day or so, please excuse. Dolly is expected to make a VIP appearance to open the new ride on Friday � which includes taking a photo with each of the charity auction winners to be the first group from the public to try out the park's new Wild Eagle roller coaster � as well as make various "surprise" appearances around the park that day and a park tour sometime in the afternoon, weather permitting. On Saturday, she's expected to make additional "surprise" appearances around the park plus her annual Parade of Nations running from Showstreet to Heartsongs at 4:15 p.m., weather permitting. In related news, the park has released three versions of the new ride's theme song, written by Dolly (you may recall news of that song being first reported here about a month and a half ago). The songs appear on the park's official Facebook page, and visitors are being asked to choose which they like best: a ballad version, a country version or a full orchestral version. Vote here! Time magazine this week announced its 140 best Twitter feeds that its editors suggest people follow for 2012, and Dolly was among them. About her feed, the publication noted: "Dolly Parton is a wealth of experience. One of the best-selling female country artists of all time, Parton has been a professional since she was a kid in the 1950s. When a legacy this great tweets, we listen. Because she's Dolly, but mostly, because she's usually right." With 1.6 million followers, Dolly was one of the 20 or so biggest Twitter accounts included on the list. Read the full list here and follow Dolly here. When the Billboard charts are released Thursday, Whitney Houston's Greatest Hits featuring her cover of Dolly's "I Will Always Love You," will hold steady at No. 6, even though last week's sales fell 35 percent to 45,000 copies, the magazine revealed on Wednesday. In addition, preliminary sales figures show the other CD containing the song, The Bodyguard soundtrack, will fall between five and 10 places to the mid-20s on the chart with about 14,000 copies moved last week. Former Dolly fan webmaster Phil Wells, murdered in November by an ex, was profiled in The Jewish Journal Wednesday. Check out the article here. When it rains, it pours :) After months of not posting any video diaries, Dolly has now released three in the span of less than a week. The third one came out on Tuesday thanking her Australian fans for making her Dolly: Live From London go gold Down Under. Watch it in the media player above or by visiting YouTube here. Dolly's current film Joyful Noise cut its gross in half again for its 10th weekend at the box office, taking in $29,777 in ticket sales on just 65 screens to come in at No. 56. Since opening, the film has sold $30,920,167 in tickets. In related news, Religious Dispatches Magazine has an analysis of the film here. Also, the cast of the new all-African American version of Steel Magnolias was announced Monday, and Queen Latifah, Dolly's co-star and executive producer of Joyful Noise, was revealed as a cast member and executive producer of that project, too. According to Entertainment Weekly here, Latifah plays Sally Field's character of M'Lynn, Jill Scott takes on Dolly's Truvy, Phylicia Rashad does Olympia Dukakis' Clairee, her daughter Condola Rashad will be Julia Roberts' Shelby, Alfre Woodard does Shirley MacLaine's Ouiser and Adepero Oduye is Daryl Hannah's Annelle. Dolly talks about forgetting lyrics and using teleprompters in concert with an interview on AOL's country music blog The Boot posted on Monday. Check it out here. Another brief Dolly video diary entry was released Saturday, this time to wish her fans a happy St. Patrick's Day. Check out her message in the media player above or by visiting YouTube here. Although they continue to slip, albums by the late Whitney Houston featuring her cover of Dolly's "I Will Always Love You" continue to sell overseas. In Australia, her Ultimate remains at No. 1 catalog albums but loses seven to No. 13 pop, while Essential falls four to No. 15 pop and Greatest Hits dips six to No. 34 pop and two to No. 5 catalog albums. In Great Britain, her Essential rebounds two spots to No. 20 pop. Also overseas, The Very Best Of Dolly Parton, Volume 1 dips six to No. 20 Australian country albums in its 106th week in the top 20 Down Under and falls off the 50-position pop catalog albums list there, down from No. 46 last week, its 32nd on the tally, while in the U.K., The Little Willies' For The Good Times, featuring Norah Jones' cover of Dolly's "Jolene," holds steady at No. 11 country in its 10th week there. Another high school production of Dolly's 9 To 5: The Musical has been announced. The show will be performed at Uniontown Area High School in Pennsylvania later this week, the Pittsburgh Tribune Review reported over the weekend here. As Joyful Noise starring Dolly continues its march toward leaving theatres, it dropped 13 spots to No. 50 for its ninth week in cinemas, earning just $81,236 through Thursday night on 103 screens this week, almost half the box office gross it took in last week. Since opening, the film has seen $30,890,390 in ticket sales. Just in time for St. Patrick's Day, Dolly's A Life In Music Ultimate Collection on Friday dropped back off the top 100 pop albums chart in Ireland, down from No. 96 last week, its 13th on the tally. Whitney Houston's Ultimate Collection holds steady at No. 7 pop, Essential falls five to No. 15 pop and The Bodyguard soundtrack loses two to No. 14 compilations. With Dolly's current movie project about to leave theaters, sales of its accompanying CD also continue to fall, with the title gone from the top 200 best-sellers of current release albums this week, the March 24 Billboard charts released Thursday revealed. The Joyful Noise Soundtrack with Dolly falls off the current album tally, down from No. 196 last week, its eighth. The collection drops five to No. 14 gospel albums, four to No. 20 Christian albums, eight to No. 31 Christian and gospel albums, four to No. 18 soundtracks and seven to No. 47 independent label albums. The CD will likely fall off those other charts in coming weeks but could re-enter several in the weeks following release of its DVD on May 1. In related news, the film's Irish and Brazilian premieres have been announced. It will open April 27 in Ireland, the same day it opens in the U.K. It will start screening June 15 in Brazil, where it will be titled in Portuguese as Can��o do Cora��o, or "Song From the Heart." Thanks, Marcos! In other chart news, pop icon Whitney Houston's cover of Dolly's "I Will Always Love You" continues to sell in the weeks following her death, although chart slides indicate numbers are mixed. The song is seen losing one to No. 15 recurrent songs, gaining 10 to No. 43 digital songs, re-entering the digital tracks chart at No. 42 and rising five to No. 8 R&B/hip-hop digital songs. Houston's Greatest Hits dips four to No. 6 pop albums but holds steady at No. 1 pop catalog albums and No. 1 R&B/hip-hop catalog albums. It falls two to No. 3 Internet sales and three to No. 11 Tastemakers. It re-enters the digital albums list at No. 21. The Bodyguard falls 10 to No. 15 pop and one to No. 3 pop catalog albums, one to No. 2 soundtracks, eight to No. 11 Internet sales and holds steady at No. 2 R&B/hip-hop catalog albums. Up north, her Essential is No. 3 Canadian pop and No. 1 Canadian R&B, The Bodyguard No. 18 Canadian pop and No. 2 Canadian R&B, Greatest Hits No. 26 Canadian pop and No. 3 Canadian R&B and Ultimate No. 32 R&B. The Little Willies' For The Good Times, with Norah Jones' cover of Dolly's "Jolene," gains eight to No. 56 country albums in its ninth week. Rhonda Vincent's Taken, with Dolly on one track, re-enters the 15-position bluegrass list at No. 15 for a 34th week, while The Grascals' Country Classics With A Bluegrass Spin, with Dolly on three songs, gains one to No. 11 in its 52nd chart week. Overall, Lady Antebellum's Own The Night stays at No. 1 country and shoots up a dozen digits to No. 4 pop in its 26th week, while Luke Bryan's EP Spring Break 4... Suntan City debuts at No. 2 country and No. 9 pop. It's been quite a while since Dolly posted a new video blog, but a brief one came out Thursday updating what she's been up to while resting after her tour and announcing the British opening of 9 To 5: The Musical in Manchester, England, on Oct. 8. Watch it on YouTube here or in the media player above. In related news, check out a review of the local production at Lancaster, Pa.'s, Dutch Apple Dinner Theatre from Lancaster Online here. Dolly's famous "rooster to a hen" speech from 9 To 5 made NPR's blog on Wednesday discussing the four best "take this job and shove it" moments they could think of for all time. The other three were a scene from Jerry McGuire and two real-life events: President Eisenhower's farewell address and JetBlue flight attendant Steven Slater. Read more here. It looks like the late Whitney Houston's Greatest Hits, featuring her cover of Dolly's "I Will Always Love You," will lose four places in this week's charts to come in at No. 6 with 70,000 units sold. The soundtrack to The Bodyguard, which also features the song, looks to remain in the top 20, perhaps slipping 11 spots to No. 16 with about 21,000 copies moved last week. The final charts will come out Thursday. Wanna see one of Dolly's quilts? A handmade quilt using old stage costumes was made for her in 1974 by her Aunt Dora Valentine and is on display at the 18th Annual 'A Mountain Quiltfest' at the Music Road Convention Center through Saturday, Sevier County, Tenn.'s Mountain Press reported here this week. Joyful Noise starring Dolly and Queen Latifah completed its ninth weekend at the box office Sunday, dropping eight spots to 46th place with a gross of just $58,552. It plays on 103 screens this week, about half as many as the previous week. Since opening, the film has grossed $30,867,706. The film opens in Singapore on Thursday, prompting a Dolly telephone interview with the local newspaper Today in which she discusses the movie's mediocre box office standing, noting: "The movie was not as big as we hoped it would be. But you go into every project hoping it's going to be a hit. Of course, not everything is. Sometimes you're shocked, sometimes you're surprised, sometimes things that you don't think will be that big turn out to be a hit. And it was a joyful time for me." Read more here. Also, co-star Jeremy Jordan spoke with Broadway.com here about the project, including how Dolly is "is the sweetest, kindest person in the whole world." It looks like the late Whitney Houston's sales are leveling off. With about 55 percent of sales reporting to the preliminary Hits Daily Double building chart, her Greatest Hits was at No. 5 with 41,525 copies sold, compared to last week's No. 2 with 112,000 units, while The Bodyguard soundtrack was at No. 8 with 15,500, versus 43,000 at No. 5. The final sales figures and chart positions should be announced by Billboard on Wednesday before the full charts come out Thursday. Another story of Dolly in the air (she's known for her fear of flying and finding ways to keep herself distracted if she can't take her bus) was released this week with a USA Today profile of a book by a former flight attendant. Check out what she had to say about Dolly here. Library Moves In Minn., N.Y.
Dolly's Imagination Library continues to expand its reach throughout the country. The Madison County Courier in Canastota, N.Y., profiled its expansion into the community there with a story here, while WDAY in Detroit Lakes, Minn., announced the program's launch there with a piece here. Whitney Houston's cover of Dolly's "I Will Always Love You" is gone from the overseas charts, it was revealed Sunday. The track drops off the top 100 pop singles tally in Great Britain, down from No. 92 the previous week. Also there, her Essential falls 15 to No. 22 pop, while Greatest Hits falls off the pop tally, down from No. 99, and Ultimate off the digital sales list, down from No. 22. Also across the pond, The Little Willies' For The Good Times, with Norah Jones' cover of Dolly's "Jolene," slips one to No. 11 country in its ninth week there. Down Under, Houston's Ultimate remains at No. 1 catalog albums but loses two to No. 5 pop and falls off the digital albums list, down from No. 33; Essential dips three to No. 11 pop and Greatest Hits falls 13 to No. 28 pop, holds steady at No. 3 catalog albums and drops 10 to No. 21 digital albums, while The Bodyguard soundtrack falls off the top 50 pop albums list, down from No. 44. Elsewhere on the charts, The Very Best Of Dolly Parton, Volume 1 slides one to No. 14 Australian country albums in its 105th week and rises three to No. 46 pop catalog albums in its 32nd week there. Dollywood Foundation President David Dotson posted to the Rotary International blog an entry about the power of Rotary Clubs working with Dolly's Imagination Library to spread literacy throughout the U.S., Canada and Great Britain. Take a read here. Dolly's film Joyful Noise looks to be very close to ending its theatrical run. The movie wrapped up its eighth week at the box office Thursday night with a $155,841 gross at No. 37, down from No. 34 and $250,000 the previous week. Since release, the picture has sold $30,809,154 in tickets. It likely lost another large chunk of its screens on Friday after spending the past week at just 202 cinemas. Dolly's collaboration between Dollywood and Gaylord Entertainment to build a water and snow park in Nashville will seek a 12-year, 60 percent discount on its property and real estate taxes, the city revealed Friday. The deal would require construction to start before the end of 2013 and the park to open by June 2015, according to The Tennessean here. The Glee cast version of Dolly's "I Will Always Love You" has sold 45,000 digital downloads, The Hollywood Reporter noted here in an article about the show's plans to have a Whitney Houston-themed episode this season. By coincidence, the series used the song in an episode that had been filmed prior to Houston's death and aired within days of her passing. By comparison, Houston's cover of the song has been downloaded 735,000 times since news of her death was revealed. The Dolly compilation A Life In Music Ultimate Collection re-enters this week's Irish pop albums chart at No. 96 to log a 13th week on the tally there. Three Whitney Houston CDs featuring her cover of Dolly's "I Will Always Love You" stick around. Ultimate Collection falls four to No. 7 pop, Essential dips three to No. 10 pop and The Bodyguard soundtrack loses 10 to No. 12 compilations. Houston's The Collection falls off the top 100 pop albums, down from No. 73 the previous week. A new video has been released by VH1's Save the Music Foundation and DoSomething.org, a national organization for young people. The two groups are teaming up to launch Battle for the Bands, a campaign in support of music education, and Dolly's interview, viewable in the media player above or by visiting YouTube here, is about her beliefs on the importance of exposing young people to music education. The late Whitney Houston's cover of Dolly's classic composition "I Will Always Love You" is once again off the pop chart. The song falls off the Hot 100 singles tally in the March 17 Billboard charts released Thursday, down from No. 30 in its third week on the list following Houston's death. The song also falls off the digital tracks chart, down from No. 12, and Canadian digital sales chart, down from No. 32. It loses 40 to No. 53 digital songs and 10 to No. 13 R&B/hip-hop digital sales. Houston's Greatest Hits holds on at No. 2 pop albums, No. 1 pop catalog albums and No. 1 R&B/hip-hop catalog albums. It rises one to No. 1 Internet sales but loses five to No. 8 Tastemakers. It falls off the digital albums list, down from No. 5. The Bodyguard rises one to No. 5 pop and holds steady at No. 2 pop catalog albums, No. 1 soundtracks and No. 2 R&B/hip-hop catalog albums. Up north, her Essential is No. 4 Canadian pop and No. 1 Canadian R&B, The Bodyguard No. 18 Canadian pop and No. 3 Canadian R&B and Greatest Hits No. 18 Canadian pop and No. 3 Canadian R&B. The Joyful Noise Soundtrack with Dolly falls 52 places to No. 196 in its eighth week on the current albums chart, so it may be gone soon from that list. The title gains one to No. 9 gospel albums and loses six to No. 16 Christian albums, four to No. 23 Christian and gospel albums, two to No. 14 soundtracks and 10 to No. 40 independent label albums. The Little Willies' For The Good Times, featuring Norah Jones' cover of Dolly's "Jolene," falls five to No. 64 country albums in its seventh week, also dropping out of the top 50 Canadian country list, down from No. 43. Rhonda Vincent's Taken, with Dolly on one song, falls back off the 15-position bluegrass list, down from No. 13 in its 33rd week, while The Grascals' Country Classics With A Bluegrass Spin, featuring Dolly on three tracks, dips two to No. 12 in its 51st chart week. Overall,�Lady Antebellum's Own The Night stays at No. 1 country and rises three to No. 16 pop in its 25th week, while Luke Bryan's Tailgates and Tanlines holds steady at No. 2 country and gains three to No. 18 pop in its 30th week. Ray Stevens discussed briefly his work as one of Dolly's early producers during her time on Monument Records in the 1960s as part of his interview with Billboard magazine on a new boxed set of the history of comedy music. "She was just bubbling over with talent, and so pretty," he recalled. "I went in the studio with her, and we worked hard and did what I think were really good records. I think we were ahead of our time. It was more pop-oriented than the times called for. Later on, she broke into the business with some songs that were a little more country." Read the article here. Dolly's music made another appearance on FOX's American Idol Wednesday night. The show featured music of Whitney Houston and Stevie Wonder, and contestant Jessica Sanchez chose her cover of Dolly's classic "I Will Always Love You," which wowed judges. Watch it here. Billboard on Wednesday released this week's top 10 chart, confirming Whitney Houston's Greatest Hits will retain its No. 2 spot, although it actually sold 112,000, which was 2,000 more than the preliminary numbers showed. Since her death, the album has now sold 527,000 copies. Also, The Bodyguard soundtrack sold 43,000 to land at No. 5, bringing its total since her passing to 105,000. While the standing for her cover of Dolly's "I Will Always Love You" won't be known until the full charts come out on Thursday, a report here from The Hollywood Reporter on Houston's will noted that the song has been downloaded 735,000 times since she died, which would mean about 67,000 copies were sold last week. As the song also appears on the two albums, its combined U.S. sales since the pop icon died have now passed 1.37 million copies. Sarah Jayne, who is billed as the U.K. and Europe's "leading Dolly Parton tribute artist," is celebrating her 20th anniversary of impersonating Dolly in concert with a golf tournament and benefit gala May 2 at the Marriott Tudor Park Hotel Country Club outside of London with proceeds being donated to Dolly's Imagination Library. Learn more here, and check out a picture of her with Dolly here. Dolly's film Joyful Noise slipped five places in its eighth weekend at the box office, taking in $115,826 in ticket sales for the 38th place. The picture lost another 75 screens, leaving it at just 202 cinemas nationwide. Since its release, it has grossed $30,769,139. In related news, the DVD's cover art was released on Tuesday � see it at left � and Amazon.com on Tuesday also added the order pages to get your copy of the BluRay disc here and regular DVD here. As was reported here Sunday night, the BluRay comes out May 1. Amazon also has the DVD hitting stores May 1, too, but earlier reports had that scheduled for May 29. All 52 seats for the first ride on Dollywood's $20 million Wild Eagle roller coaster with a meet-and-greet with Dolly sold out in less than 12 hours on Monday. The final 12 seats were sold in the three hours following posting of the news of the sales on this site. Two additional seats became available on Tuesday and were sold within 30 minutes of being announced on your webmaster's Facebook page. A photo of the new ride at its peak was released Tuesday via Business Wire. Check it out here. The HITS Daily Double building charts released on Monday, which cover most music retailers, confirmed the Billboard projections that Whitney Houston's Greatest Hits sold nearly 110,000 for the No. 2 position, while her The Bodyguard soundtrack moved about 44,000 for the No. 4 spot. Both albums contain her cover of Dolly's "I Will Always Love You." 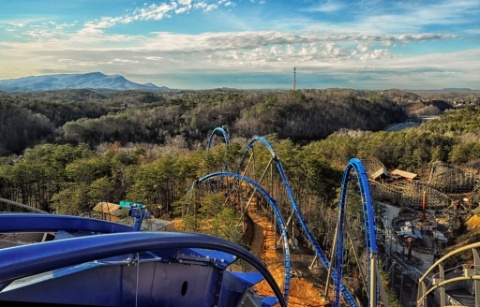 As was teased here in Friday night's news update, Dollywood on Monday afternoon announced on its Facebook page that the first 52 seats on the park's new Wild Eagle roller coaster would be sold via eBay's Buy-It-Now function to benefit the American Eagle Foundation. The first 52 people to pay $750 each (raising $39,000 for the nonprofit agency that operates the park's bald eagle sanctuary and breeding program) will each receive a prize package similar to the one offered for 2007's opening of Mystery Mine: attendance at the VIP event for the ride's opening on passholder preview day March 23 plus a seat on the ride's inaugural flight and a meet-and-greet with Dolly on the ride's load platform including a photograph with Dolly that she will autograph. Within the first two hours of being available, about half of the rides had sold. As of press time Monday night, only a dozen remained available. Get yours here. The 2009 concert CD/DVD collection Dolly: Live From London, recorded at the city's O2 Arena on her 2008 Backwoods Barbie World Tour, is getting a second life through a re-release next month in Cracker Barrel stores nationwide. Coming out under the title An Evening With . . . Dolly, the DVD appears to be the same as was originally released, even including the "Soundcheck" bonus featurette. (Monday's announcement did not note whether the original DVD's other bonus features � "Interviews," "London Loves Dolly" and "Meet and Greet" � will also be included.) The CD, however, has had four songs removed and two added. Gone are "Backwoods Barbie," "Better Get To Livin'," "Shinola" and "Jesus and Gravity." Added are the previously unreleased live versions of "Shattered Image" and "My Tennessee Mountain Home." The release, hitting the restaurant's physical stores and website April 2, will retail for $11.99. 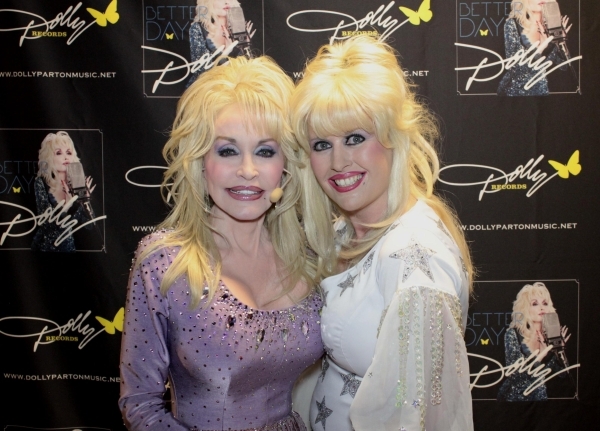 In a press release, Cracker Barrel Marketing Manager Julie Craig noted: "In 2008, we released Dolly's Backwoods Barbie - Collector's Edition CD and we are delighted to work with her on a second project. Dolly connects with her audiences and our guests in a genuine, down-home way that fits with the Cracker Barrel brand as naturally as the rockers on our front porch. And this new An Evening With...Dolly DVD and CD showcase not only her amazing musical and songwriting skills, but also her ability to entertain audiences with her heartwarming personality." Dolly's manager, Danny Nozell, added in the release: "Cracker Barrel and Dolly Parton are a great collaboration. We are excited to continue our successful venture together, and thrilled to offer this live concert experience with some of Dolly's biggest hits." The original CD/DVD was released by Dolly Records in November 2009 and was one of the worst-selling titles of her career. On the charts, it was the worst-performing non-holiday, non-greatest hits release in her catalog, topping out at just No. 30 country in the U.S. and falling off the country charts after just 10 weeks. It sat on the 200-position pop charts for just one week at No. 195. The label had so many unsold copies that it gave away a free one with just about every order from Dolly's online store for several months after its release. In Great Britain, where the concert was filmed, it fared much better, going to No. 1 country and No. 33 pop. Billboard predicts Whiney Houston's Greatest Hits, with its cover of Dolly's "I Will Always Love You," looks to hold onto its No. 2 spot on the pop charts coming out later this week, selling around 100,000 copies for the week that ended Sunday. Her soundtrack to The Bodyguard should remain in the top 10 another week as well, moving between 40,000 and 50,000 copies to come in around No. 4, the magazine reported. As was first tallied on this site last week, Houston's cover of the song sold 1.15 million copies in individual downloads and copies of these two albums in the U.S. during the 16 days following Houston's death. Last week's additional sales will likely push it past 1.4 million units since her passing. Rotary International is once again promoting Dolly's Imagination Library literacy program through its partnerships with Rotary Clubs throughout the country. The program will be profiled again in the March issue of its international Rotarian magazine. An online version of the article was posted Monday here. In related news, The Russellville Courier News reported here Monday that the River Valley United Way is bringing the program to the Arkansas River Valley. 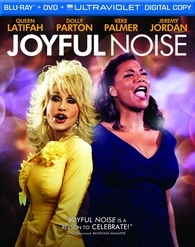 The film Joyful Noise starring Dolly and Queen Latifah will hit DVD in May, Disc Dish reported over the weekend. The picture is slated for a May 1 BluRay/DVD combo release with a suggested retail price of $35.99 and regular DVD release on May 29 at a suggested retail price of $22.97, the site reported. The combo pack will also include bonus features "Spotlight on a Song: Dolly Parton's 'From Here to the Moon,'" "Inspiration of Joyful Noise," "Make Some Noise," "Leading Ladies," extended songs and a digital version of the film available for download. No word on which of these features will also appear in the regular DVD release. In addition, thanks to John for alerting me that iTunes is also showing they will be selling downloads of the film starting May 1 as well. In related news, a few more nations for the foreign release of the film have been announced. In addition to the previously announced April 26 Australian/New Zealand release, the movie will hit Singapore March 15 and the U.K. April 27, according to IMDB. Now that her death has settled in, sales of Whitney Houston's recordings overseas continued to decline last week. Her cover of Dolly's "I Will Always Love You" drops another 48 places to No. 92 pop in the U.K. and off the 50-position Australian pop singles chart and 40-position digital sales chart, down from No. 24 and No. 25, respectively. In the U.K., her Essential is at No. 7 pop, Greatest Hits at No. 99 pop and Ultimate at No. 22 digital sales. Down Under, Ultimate is No. 3 pop, No. 1 catalog albums and No. 33 digital albums; Greatest Hits No. 15 pop, No. 3 catalog albums and No. 11 digital albums; Essential No. 8 pop and The Bodyguard soundtrack No. 44 pop. Elsewhere on the charts, The Very Best Of Dolly Parton, Volume 1 falls three to No. 13 Australian country albums in its 104th week and 19 to No. 49 pop catalog albums in its 31st week there. In the U.K., The Little Willies' For The Good Times, featuring Norah Jones' cover of Dolly's "Jolene," holds steady at No. 10 country in its eighth British week. Promoting her new show GCB, Kristen Chenoweth discussed her idolization of Dolly in a weekend interview with NPR's All Things Considered. Read or listen to it here. Joyful Noise ended its seventh week at the box office slipping two spots to No. 34 for the week with $250,594 in ticket sales. Since opening, the film has grossed $30,653,313. Dolly's back off the charts in Ireland. Her compilation A Life In Music Ultimate Collection falls off the top 100 Irish pop albums chart this week, down from No. 93 in its 12th week. The late Whitney Houston's cover of Dolly's "I Will Always Love You" drops 32 to No. 53 on the pop singles chart, while Houston's Ultimate Collection loses the top spot to drop to No. 3 pop this week. Her Essential inches up one to No. 7 pop, Greatest Hits falls off the top 100, down from No. 42 pop albums, and The Collection drops 25 to No. 73 pop albums. Also, The Bodyguard rises five to No. 2 compilations. Fans in The Netherlands will get to see the Canadian film The Year Dolly Parton Was My Mom this weekend. The movie is scheduled to air at 3:30 p.m. Sunday on channel Ned 3. Thanks, Kim! According to a YouTube video here, The Irish Mail will give a free Dolly Parton & Friends CD to everyone who buys the paper on Sunday. The track listing was not available, but the video played her 1963 recording of "Release Me," so it's likely one of the compilations that contains her early year Goldband and Somerset recordings. Following this week's tragic tornadoes throughout the Midwest and South, Dixie Stampede wants those impacted around its Branson, Mo., dinner theatre to have a night to take their minds off of their troubles. According to Branson Trilakes News here, Dolly's facility offered local residents in the impacted areas free tickets Friday and Saturday night. Whitney Houston continued to move massive numbers of albums in the second full week of sales following her death, the March 10 Billboard charts released Thursday confirmed. As was previously reported, her cover of Dolly's "I Will Always Love You" tumbles 27 places to No. 30 pop singles in its third week of returning to the charts. The song also falls off the adult contemporary recurrent singles chart and R&B/hip-hop recurrent singles chart, down from No. 11 and No. 27, respectively. The track slips 11 to No. 13 digital songs, 10 to No. 12 digital tracks, two to No. 3 R&B/hip-hop digital sales and 29 to No. 32 Canadian digital sales. The Glee cast version leaves the charts after just one week at No. 87 pop, No. 30 pop digital sales and No. 75 hot digital songs. Houston's Greatest Hits holds on at No. 2 pop albums, No. 1 pop catalog albums and No. 1 R&B/hip-hop catalog albums. It shoots up a dozen places to No. 2 Internet sales and three to No. 3 Tastemakers but loses three to No. 5 digital albums, two to Canadian R&B albums and 18 to No. 29 Canadian pop. With physical CDs making their way to stores, The Bodyguard sees a massive jump. The soundtrack jumps 32 spots to No. 6 pop, two places to No. 2 pop catalog albums, one to No. 1 soundtracks, one to No. 2 R&B/hip-hop catalog albums, 29 digits to No. 31 Canadian pop and five to No. 5 Canadian R&B. It enters the Tastemakers list at No. 11 and Internet sales at No. 3 but falls off the digital albums chart, down from No. 10. Up north, her Essential moves up to No. 1 Canadian R&B and No. 3 Canadian pop, while Ultimate comes in at No. 12 Canadian R&B and No. 67 Canadian pop. The Joyful Noise Soundtrack with Dolly drops out of the top 200 pop albums, down from No. 139 in its sixth week, while losing 32 spots to No. 144 in its seventh week on the current albums list, also dipping four to No. 10 gospel digital albums, four to No. 19 Christian and gospel digital albums, six to No. 12 soundtracks and 14 to No. 30 independent label albums. It holds steady at No. 10 Christian digital albums. Elsewhere on the charts, The Little Willies' For The Good Times, featuring Norah Jones' cover of Dolly's "Jolene," slides eight to No. 59 country in its seventh week and nine to No. 43 Canadian country. Rhonda Vincent's Taken, with Dolly on one song, re-enters the 15-position bluegrass list at No. 13 for a 33rd week, while The Grascals' Country Classics With A Bluegrass Spin, featuring Dolly on three tracks, holds steady at No. 10 in its 50th chart week. Overall,�Lady Antebellum's Own The Night stays at No. 1 country but loses 10 places to No. 19 pop in its 24th week, while Luke Bryan's Tailgates and Tanlines gains two to No. 2 country and one to No. 21 pop in its 29th week. With the 2012 season opening of Dollywood just three weeks away, the park has settled the second of two lawsuits that impact ride offerings for the new year. The Mountain Press reported here Thursday that a legal battle with a Hawaiian company that operated the SkyZip zip line through the park since 2009 had been settled privately. 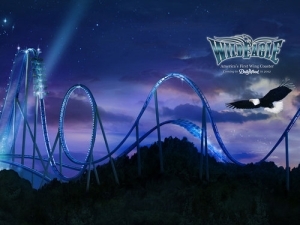 The company had argued that construction for the new Wild Eagle roller coaster had weakened trees, causing them to fall during a storm and damage the zip lines last year. When sued, the park filed a counterclaim alleging breech of contract by the company. The terms of the agreement were not disclosed, but starting in the 2012 season the zip lines will be operated by the park itself rather than the outside company. Thanks, Chuck! The action follows the recent settlement of a lawsuit against the German manufacturer of the park's 2006 ride addition, the $6.5 million Timber Tower. The attraction had been plagued with malfunctions since its debut, resulting in numerous ride closures until the matter began to be litigated and the ride was shuttered for the entire 2011 season. Terms of that deal were also sealed, according to TV station WBIR here. The Lane Twins' fan documentary Hollywood To Dollywood will soon land in Music City. AOL's country music blog The Boot reported here Thursday that the film will be one of the highlights of the April 19-26 Nashville Film Festival. The United Way of Northwest Arkansas is kicking off Dolly's Imagination Library literacy program in their area of the state, NWA Homepage reported here Thursday. In the first 16 days following pop icon Whitney Houston's death, her cover of Dolly's classic song "I Will Always Love You" has sold an astonishing 1.15 million copies in the U.S. The individual song has been downloaded 668,000 times since her passing, while the albums that contain it, Greatest Hits and The Bodyguard have sold 413,000 and 72,000, respectively. In the past week ending Sunday, her compilation sold 174,000 copies, roughly the same number as the previous week, which Billboard noted will allow it to retain its No. 2 spot on the American pop albums charts when they are released Thursday, while the movie soundtrack advances from No. 38 to No. 6 thanks to 47,000 copies moved last week, a 176 percent increase from the previous week. With her debut album also making its way into the top 10 at No. 9 this week, Houston becomes the first female artist to rack up three top 10 titles in the same week, the magazine noted. The individual song saw 101,000 downloads last week, down 72 percent from the previous week, which will drop it from No. 2 to No. 13 digital songs and from No. 3 down to No. 30 on the Hot 100 pop singles chart. In the 20 years between the release of Houston's cover version and her death, it had sold more than 19 million in the U.S., so sales after her passing have pushed it past the 20 million mark stateside. Worldwide, the song and albums containing it had sold more than 60 million prior to her death. Our thoughts and prayers are with those impacted by the devastating tornadoes that hit the Midwest and South Wednesday, including one that severely damaged the "strip" in Branson, Mo. According to reports, the tornado's path of destruction ended at Dolly's Dixie Stampede in the resort community, with news photos of the building showing no major damage even though the American Bandstand theater next door saw significant destruction. Dolly's dinner theater noted on its Facebook page that the building only had minor roof damage with no staff members or animals injured. The Branson facility in Dolly's chain had opened for its new season just the previous weekend. Dolly's Imagination Library in Memphis is having a significant impact in preparing children to enter school ready to learn, local and state officials revealed with release of a study this week, The Memphis Daily News reported here. The largest affiliate of the program in the world, Memphis children in the program scored eight points higher on average in an 86-point reading readiness test than those who were not in the program. Edna Milton Chadwell, the final madam of the Chicken Ranch on whom the character of Miss Mona in The Best Little Whorehouse In Texas was based, has died at age 84, The Times Union reported Wednesday here. Dolly earned a Golden Globe nomination for Best Actress for her portrayal of the character in the film adaptation of the Broadway musical, although Chadwell herself hated the movie, according to her family, the story noted.